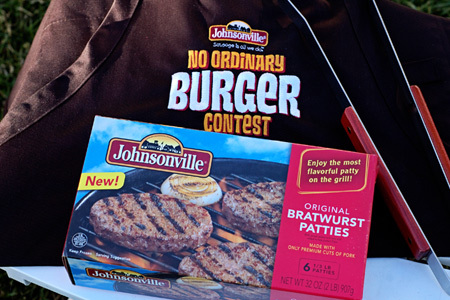 I was recently contacted by the folks at Johnsonville about a contest that features their new line of sausage patties. To introduce the new products they're giving you the opportunity to let your creative juices flow. Oh, and you just might end up $10,000 richer for your effort. Grillers are familiar with Johnsonville's reputation for great sausage. Well, these patties bring all of that sausage deliciousness in burger form. The No Ordinary Burger Contest is just that. It's your chance to use one of the four varieties of Johnsonville Patties (bratwurst, Italian, cheddar bratwurst and chorizo) to create your ultimate sausage burger. Through July 3, 2012, share your unique Johnsonville burger recipe, and you'll have a chance to be one of the select finalists who will be chosen to participate in a cook-off live on national television this August. The winner will receive the $10,000 grand prize! Here are the official rules. I'll be entering two recipes, the first of which I'll post tomorrow. The other is still a work-in-progress, but it will be ready next week. Well my brain gears are a-whirlin' right now! Can't wait to see what you come up with. Having a great product like Johnsonville to work with helps! Goos luck to everyone! !